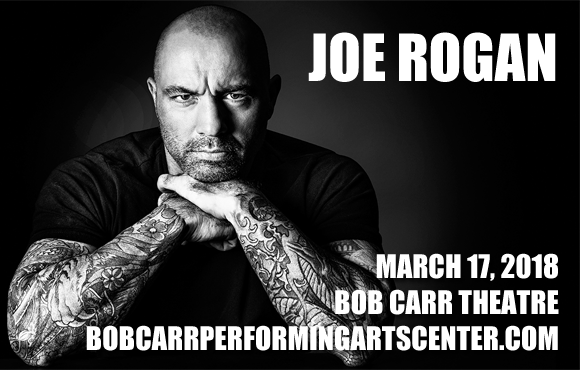 Comedian and jack-of-all-creative-trades Joe Rogan is coming to Bob Carr Theater on Saturday 17th March 2018 for one unmissable night! The MMA commentator, podcast host and funnyman delves into the world of unexplained paranormal mysteries as he entertains, shocks and amuses on his Strange Times Tour! Joe Rogan is an American stand-up comedian, color commentator, podcast host, and retired martial artist, who started his career in the late 1980s, performing blue stand-up comedy routines in Boston. After moving to LA in 1994, Rogan began working with Disney on the TV shows Hardball and NewsRadio, as well as spending his time working the local comedy circuit. Rogan went on to work as an interviewer for UFC (Ultimate Fighting Championship), and he began working for them as a color commentator in 2002. Rogan released his first comedy special in 2000, and has produced eight comedy specials to date. His podcast, the Joe Rogan Experience, was launched in 2009 and has since become one of the most popular podcasts available.